Add a shimmery look to your princess' room with these Sparkling Disney Belle Giant Wall Decals by RoomMates Decor! 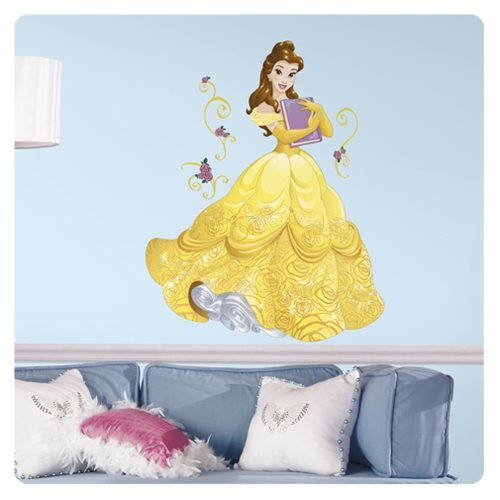 Designed with a breath-taking image of Disney Princess Belle dressed in her gorgeous yellow gown as she holds one of her favorite books, these wall decals are made with glitter ensuring a dazzling effect on the wall! Looking to get this look right away? No problem! Build your Disney Princess Belle in no time with our revolutionary peel and stick technology. Peel each wall decal and stick to the wall! Remove as often as needed. That's removable and repositionable wall decor at it's best! Measures 39-inches tall x 28-inches wide when complete. Ages 4 and up.